Someone hurts us in a way that feels irreparable and we say, “I will never forgive you.” Someone wounds us emotionally or physically and we think, “That’s unforgivable.” Yet, we’re constantly being told that forgiveness is vital for our mental health. Why? [https://www.psychologytoday.com/blog/mindful-anger]. What I often hear from people skeptical of forgiveness is that certain things seem unforgivable, certain people don’t deserve forgiveness, and that even the concept of forgiveness sounds like very hippy-dippy talk reserved for therapists and spiritual leaders. I’ll explain what I mean when I use the word “forgive,” why I recommend the healing power of forgiveness, and how to heal even when you don’t feel you can forgive the person who hurt you. What is forgiveness? 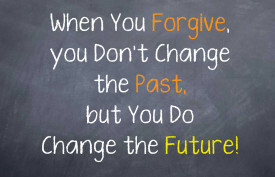 Forgiveness is the letting go of a grievance or judgment that you hold against someone else. When you forgive you also let go of feelings of bitterness, resentment, and vengeance.Many people have difficulty with the word “forgiveness.” We imagine forgiveness involves saying, “I forgive you” and includes a hug, pat on the back, or a blessing. That may be true sometimes, but not all the time. Forgiveness doesn’t have to involve the other person and it is not for their benefit. (To learn more about what forgiveness is and isn’t, please read part one: How Do You Forgive Even When It Feels Impossible? If the word “forgiveness” bothers you, you don’t have to use it (or you could make up a new one). Processing emotional trauma and releasing old wounds is about more than a single word. 2. Why should I forgive?